Registration for teams in season 2018/2019 is open. Deadline is until the start of the season on 29.10.2018. We are staying on piskvorky.net with the same time control as in last season (10+3). For joining the league captains of teams have to visit the page 'My Team -> Edit team' and set the checkbox 'My team wants to play in the current season 2018/2019'. Teams will appear in 'Playing teams' after administrator confirms them. Teams can pick from 3 default admin dates, 15:00, 17:00, 19:00 server time, in case a team wants a different one than 19:00, team captain has to post a request in main forum thread here. See you soon in interesting matches! Zapisy trwają do 5 listopada. Wake - Piece of cake. Q: Why do you write the name of Zoli's team in capital letters, thereby distinguishing it from all other teams? A: I write the team's name exactly as written by Zoli. A: The name of our team was contrived by Oksana Matsyuk. Originally it was her team. They were looking for an experienced captain, and I was precisely an experienced captain who wanted to captain a team of novices. So the team became mine, and I do not really care about its name. Q: Why do you think many strong Russian players like Nirvana, Furla, Valkon, and Edward are not playing this season? They played in the past, but are not playing now. A: I think that everyone has its own reason. Denis dislikes the EL, as he wrote many times. Valery virtually does not play gomoku at all. Overall, the list of Russian participants always changes. Some played before, and some started playing just recently. The EL is open to everyone who agrees to obey the rules. Currently many strong Russians are playing - Nikonov, Kachaev, Litvinenko, Kozhin (as sorted by live rating). Q: From your perspective, how likely is it that Alicecooper cheated in the EL? 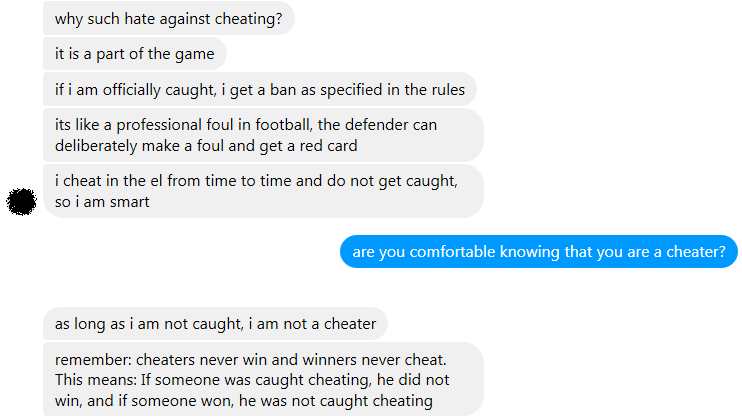 (b) I am strongly against calling anyone a cheater unless there is a proof. Q: Do you find it regrettable that the Lord of the Lords is not participating? A: The Lord of the Lords is me, and I am playing I guess you mean Alex Popiel, and, again, it is his wish not to play. I do not want to speculate as to why. Q: Which final position must your team take for you to deem its performance successful? A: Of course, we must win. 1. Я пишу название так же, как оно записано самим Золи, вот и все. 2. У нашей команды название придумала Оксана Мацюк, изначально это была ее команда и они искали опытного капитана, а я наоборот - был опытным капитанов, который хочет возглавить команду из новичков. Так что в итоге команда перешла ко мне, название мне не так важно. 3. Думаю, у всех разные причины. Денису не нравится ЕЛ (как он много раз писал), Валера вообще не играет в гомоку практически. Вообще, состав игроков постоянно меняется, кто-то играл раньше, а кто-то начал только сейчас. ЕЛ открыта для всех желающих (которые согласны выполнять правила)! В то же время много сильных русских игроков играют - Никонов, Качаев, Литвиненко, Кожин (смотрю сверху рейтинг-листа). а. уровень игры Алискупера в некоторых матчах ЕЛ и в реальных играх правда драматически отличается, это не может не вызывать подозрений. б. я категорически против того, чтобы называть кого-то читером без доказательств. Ты наверное про Сашу Попеля, опять же, это его желание - не играть. Почему - не хочу спекуляций. Na piskvorky można obstawiać wyniki EL. Czas trwania tej kolejki został wydłużony do 13.01. Humans-2015 - Piece of cake. And schemes as sharp as knives. They'll cook you on a grill. Which team will win the Euroleague? I'll say it simply: Inner Strength. CZ - GML - Piece of cake. Historia derbowych starć Demons and Wizards vs Dark Team. No i od 7 lat jesteśmy w Gran Derbi niepokonani u siebie! Niestety mamy kolejnego oszusta... Załączam screen z naszej rozmowy. Przykro patrzeć, że wśród uczestników EL są osoby z takimi poglądami. W związku z licznymi wiadomościami dotyczącymi powyższego postu, naciskającymi abym wyjawił kim jest oszust, postanowiłem powiedzieć prawdę: Prima Aprilis!